After a complete overhaul for its Android app with all the new updated features like fresh UI, easy and quick preview of photos and documents etc. 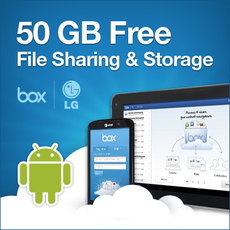 the Box Storage App has also partnered with LG, and will provide pre-loaded box accounts onto the user’s LG G series smartphones with 50GB free cloud storage facility attached to it for almost upto 1 year. If you are having a G-series LG smartphone and you are new to Box, you’ll have to download the App on your device and once downloaded to your device sign up for a free Box account. However you will be able to access this 50 GB Box account for only one year, and thereafter it would be reduced to 10 GB limited cloud storage facility. You need to make a note that this promotion is available to users from US, Western Europe and South Korea, though when we tried this in India, it actually worked. We downloaded the application through the play store on LG G Pro 2 Smart Phone and signed up with a new email and the 50Gb Storage was added right away to the account. You can download the app from Google Play Store [Link] . Also note that this offer is valid upto 31st march, 2016. Smartphones are majorly in vogue at the moment. They are not only trendy, but also highly useful for a plethora of functions especially the LG G series.